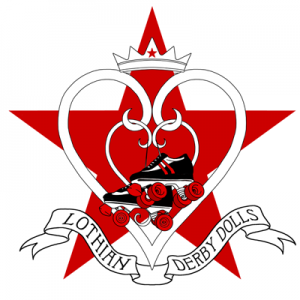 Founded in 2011 and first bouting in 2013, Lothian Derby Dolls covers the Edinburgh and Lothian Regions, we are a do-it-yourself (DIY), skater-operated roller derby league. The skaters work tirelessly — both on the track and off — to represent the league. Our first logo was featured from 2011 to 2015 when we rebranded our league through our various shifts in structure. During 2014 with the league’s expanding new skaters the decision was made to announce an A Team called The Doll Stars. Allowing the new skaters to come through and join and also start to fill a B Team. Our rebrand of image came in 2015 with our new logo. We play by the Women’s Flat Track Derby Association rules. If you would like to learn more about our league and how to join us check out our new skaters page.